Barstools, chairs and gastronomy tables by Restaline GmbH - Welcome! Resta-Line provides a wide spectrum of professional furniture to equip bars, cafés and restaurants for interior and exterior use. We're specialized in modular based system furniture. 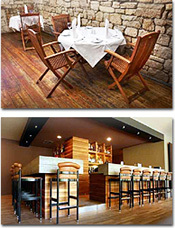 With this system, barstools such as tableracks can be created with your own style. You can easily change tabletops, subparts, pillars and seat pads individually.